ST. AUGUSTINE, Fla., Apr. 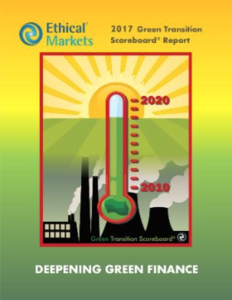 24 /CSRwire/ - Today, the latest Green Transition Scoreboard® (GTS) found that, despite Trump’s anti-green policies, private green investments now total more than $8.1 trillion USD ($8,133,456,730,370). Published annually since 2009, the GTS is a global measure of private green investment in five green sectors: 1) Renewable Energy, 2) Efficiency, 3) Life Systems (water, waste, recycling, community investing, e-learning and fintech), 4) Green Construction, and 5) Green Corporate R&D. Government investments have been omitted wherever possible and technological criteria are strictly applied. Cities and states worldwide are now leading, energized by former New York City mayor Michael Bloomberg and many others. The UNEP Inquiry on Design of a Sustainable Financial System is successfully engaging conventional financial markets. Co-director Dr. Simon Zadek welcomed the release of the GTS report, “With a changed political landscape, the case for green finance has to be strengthened, so your work is very important and has to be widely used”. The GTS report traces private money shifting from incumbent fossilized sectors to emerging green opportunities. Financial firms are being forced to innovate as pressure grows from all side. Activist ethical investors and divestment campaigns are getting louder. New pressure from above is driven by the National Development Commitments (NDCs) signed by 194 governments under the UN COP 21 and 22 climate accords and Sustainable Development Goals (SDGs). Pressure is also coming from below with the rise of Silicon Valley’s Fintech100, including crowdfunding, peer-to-peer lending, and reward currencies like SolarCoin.